A new unionist party whose members include well-known Union flag protesters has been launched in Belfast. The Protestant Coalition — which is being branded as an ‘anti-politics, political party' — was launched at the La Mon Hotel in Castlereagh on Wednesday. 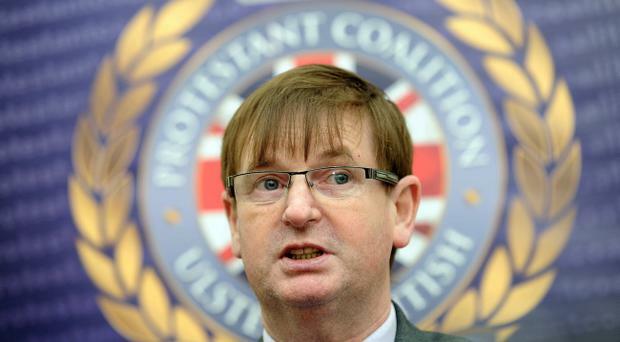 Prominent loyalist campaigner Willie Frazer was joined by fellow party member and flag protester Jim Dowson. Both men are currently on bail on charges relating to Union flag demonstrations which took place following a Belfast City Council vote to limit the flying of the flag to designated days only. Mr Frazer has said the new group is "a party that does not want to be involved in politics". Dowson is a former British National Party (BNP) fundraiser originally from Scotland. The party has cited the failings of Northern Ireland's unionist parties for its creation. The new movement — which says it welcomes members from all communities — has said it will not run for election and does not have an official leader. “This political party is only constituted for a three year period, we have no political ambitions,” it has said. Police have appealed for witnesses after a man and woman were "punched to the ground" in Omagh. A delivery driver has been left with a broken jaw after being attacked in north Belfast. A 15-year-old girl whose carotid artery was severed in an allegedly pre-arranged “fair dig” has been left with “life changing injuries,” a court heard. Friends of murder victim Lyra McKee have protested outside the Londonderry headquarters of dissident republican group Saoradh by placing red handprints on the wall.